Argentina is a favoured destination for serious mountain climbers, most intent on conquering one of the highest peaks in the world, Aconcagua, west of Mendoza. Other challenging climbs in the country include the Fitzroy Range in Parque Nacional Los Glaciares in Santa Cruz province, and the Sierra de la Fentana. The Lakes Region of Argentina, near Bariloche, is also popular for climbing, particularly at the ski resort Cerro Catedral. Mount Tronador is of particular interest in the Bariloche area, as is Piedro Parada, a beautiful desert crag located close to the Chubut River. 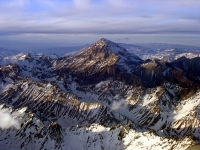 Argentina's official climbing season runs from 15 November to 15 March. Aconcagua can be climbed safely only by well-equipped teams who are in excellent physical shape, experienced, and led by expert guides. The various routes up the mountain offer all kinds of technical climbing challenges on rock, ice and snow. Most other climbing regions in Argentina insist on climbers taking officially qualified guides along for the climb. There are many local companies that organise climbing trips, providing guides, lodging, meals and drinks, necessary transportation, camping gear, climbing equipment, park and hut permits, and porters, all included in the total cost. Climbers need only bring their boots and personal hiking gear.